Sorry, but Dahle 40314 Small Office Level P-4 Cross Cut Paper Shredder with FREE Oil is no longer available to buy. The Dahle 40314 Small Office shredder will shred up to 16 sheets at once into 1/8" x 1 9/16" level P-4 cross cut pieces. It offers a 10 1/4" feed opening that empties into an 23 gal. waste compartment, and runs extremely quiet thanks to vibration absorbing rubber shock mounts. Additional features include auto on/off, reverse, continuous run operation, and SmartPower to reduce power consumption and conserve energy. Plus, the Dahle 40314 cross cut shredder can handle staples, paperclips, credit cards, and CDs/DVDs, making it a very versatile shredder. Designed to shred between 100 and 400 sheets per day. The 40314 offers quick and easy destruction of confidential materials. Transcript: This is the Dahle Small Office Level P-4 40314 Shredder! 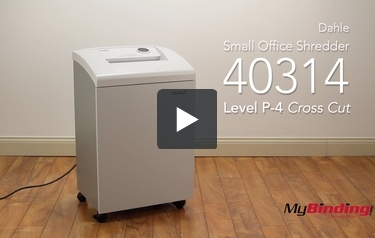 This is the Dahle Small Office Level P-4 40314 Shredder! The opening is 10 1/4 inches wide, almost perfectly accommodating for the wider length of a standard page. The 40314 is a cross-cut shredder that has a level 3 security rating. This rating is ideal for people who need to shred items like canceled checks, credit card offers, and so on. The feed opening is 10.25" wide so you can shred small items like ATM receipts as well as legal- and letter-sized sheets of paper. This shredder can process up to 16 sheets at a time and it has a thermally protected motor so you can shred non-stop. This machine's cutters are strong enough to rip up any staples or paper clips that may be attached to your documents. It will also take care of CD's, DVD's, and credit cards. The 40314 has the ability to start shredding automatically when you place something in the feed opening. There is a reverse mode you can use in case a paper jam occurs. Also, this machine doesn't use much power when it's idle thanks to a SmartPower energy-saving system. You won't hear very much noise when this shredder is running because it has rubber shock mounts that absorb vibrations. This machine has a 23-gallon waste bin, so it's a good choice for shared work areas. Using gusseted shred bags will make shred disposal much easier, so give them a try. Finally, the 40314 comes with two warranties. The first is a lifetime warranty that covers the cutting mechanism. The second warranty lasts for two years and covers parts and labor. If you need to shred more than 16 sheets at a time, the 40314 isn't going to be the right machine for you. However, it's important to realize that when you're using a cross-cut machine, the shredding capacity will generally be longer than that of a strip-cut shredder. This isn't a good shredder to have around if you need something that can fit under desk. The 40314's approximate dimensions are 34" x 22" x 17", so it's going to take up a bit of room. As you can see, the Dahle 40314 has some terrific special features such as its automatic operation and the ability to shred credit cards and CD's. The SmartPower system will help you save energy and the 23-gallon waste bin will prevent you from needing to get rid of your shreds non-stop. Also, this shredder comes with excellent warranty coverage. However, you will need to make sure that you have adequate space for this machine as it's rather large. If you decide that the 40314 is the right shredder for you, make sure you check it out. You won't regret it. Width 10 1/4" 8 3/4" 8 3/4" 9 1/2" 9 1/2" 10 1/4"
Size 1/8" x 1 9/16" 1/8" 1/8" x 1 9/16" 1/4" 1/8" x 1 9/16" 1/4"
Dimensions 34 1/4" x 21 1/2" x 17 1/8" 24 3/4" x 17" x 13 5/8" 24 3/4" x 17" x 13 5/8" 28" x 17" x 13 3/4" 28" x 17" x 13 3/4" 34 1/4" x 21 1/2" x 17 1/8"